In this post we will see how to insert a really large amount of records in a SQL Server Table at once. I decided to write about this cause recently I found myself having difficulties while trying to deploy a specific table to an Azure SQL Database. There are several tools and options for SQL Schema or SQL Data comparison with the Red Gate’s SQL Compare and Visual Studio’s SQL Server Data Tools being the most significant in my opinion. Sometimes though, even those tools can dissapoint you for unknown reasons while you have the urgent to deploy your new data. In my case, I had a table with 2 millions of records in my local SQL Server and I wanted to deploy all of them to the respective Azure SQL Database table. I ‘d never had problems deploying data to the cloud and even if I had due to certain circumstances (no comparison keys between tables, clustered indexes, etc..), there was always a walkthrough to fix the problem. In this case though, nothing seemed to work so I decided to write some simple code in a console applicaton to deploy the 2 millions of records. In the following code I read all the records from the local SQL Server and in a foreach loop I insert each record into the cloud table. Let’s see it and discuss it. While the preceding code is self descripted, easy to understand plus it does the job, it has the huge drawback of it’s slow execution time. 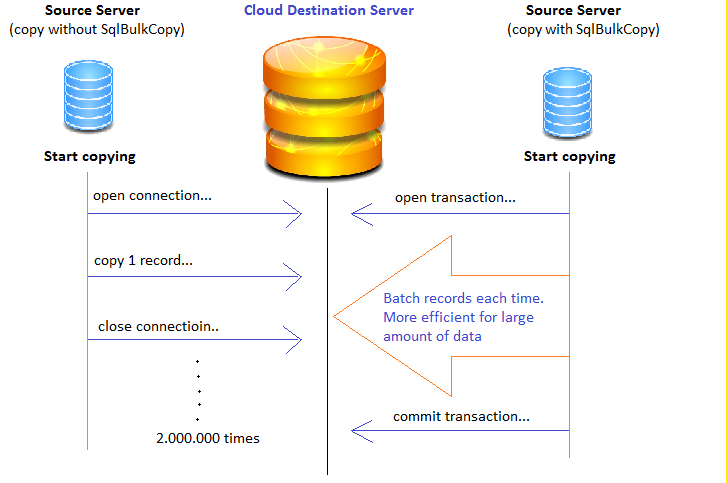 Think for a litle what is actually happening: For each record we read, we open a connection to the cloud server, copy it to the table, close the connection and so on until all 2.000.000 records are successfully copied. Taking into the consideration that following this patern, you need approximately half a second to copy a record to the cloud, so in order to copy the entire table you need… 277 hours!! Yeah, I don’t have that much time so I simply changed the code to use the SqlBulkCopy instead the foreach loop. Take a look the change in the following code. That’s it, I hope you found helpfull this post in which we saw how to commit large amount of data to an SQL Server table. P.S: Reaching the number of 100.000 views in less than a year, I would like to thank you all for visiting this blog, it really means a lot to me. I hope I had more time to write even more. Stay tuned till next time! If the applocation server & database server same then we can also use BULKINSERT. That’s true partha, thanks for your comment.